The humble clipboard was long overdue for the application of technology – it’s doesn’t take batteries and can survive a 10 foot drop! What’s that all about? 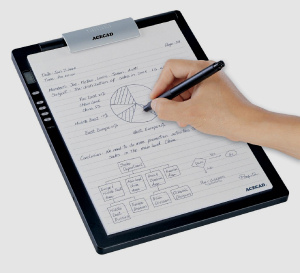 Acecad have rectified that particular flaw with their new “DigiMemo” range of digital clipboards. The Digimemo A402 captures your analogue scribbles and stores them to flash memory, where they can be downloaded later onto a PC. 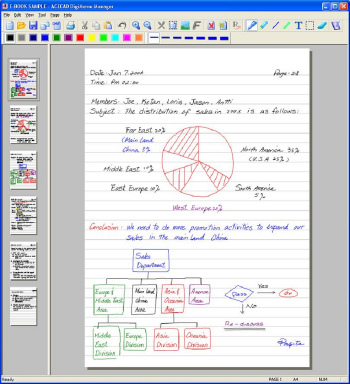 Unlike tablet PC solutions though you still use conventional paper and ink for your scribbles, so you get the benefit of keeping the original scribbles for posterity. The trick is in the “digital ink” pen, which the clipboard is responsive to. The idea is that you doodle away as normal onto a standard pad of A4, but the clipboard is sensing the movement of the pen and storing the image away for later use. Then the software translates the doodles into standard image files for you to do whatever with. Pretty neat, but no word on pricing yet. Marc I’ve done some checking, you’ve left out some of the best features!! Wow this thing is so freaking cool! no need for special paper! I must be slipping, I’m ashamed to say I missed the fact that it can be used as a tablet too. Good spot! Where do those colors come from? And the base lines on the paper? It looks more like a scanned picture. I think it must be a concept product.